March 26, 2019 | Filed under: Current Articles,Featured | Posted by: Alex A.
It’s been a long day in the saddle. After tossing your barn gear in the laundry, you fix yourself a drink and turn on the TV. It’s time to relax, and you haven’t even left the showgrounds! From keeping costs down to bringing along the kids or the family dog, there are countless benefits to camping onsite. Read on for tips and advice from some of the industry’s most fairground savvy exhibitors. Tammy Raak of Twin Cities South Trailers in Pilot Point, Texas, imparts advice from the perspective of an exhibitor and expert on living quarter trailers. Together with her husband, Gary Raak, she has been offering quality customer service in the trailer business for 30+ years. Kay Mortensen of Showtime Show Clothing is a major fixture at horse shows. After years of spending plenty of money at hotels, Mortensen is now the proud owner of a fifth wheel camper for her stays. Amateur all-around competitor, and mother of two, Vanessa Froman knows the ins and outs of making the most out of a horse “showcation.” Froman shares her insights on camping with the family. Marylyn Caliendo of MC’s Dragon Ranch is a long-time fixture on the elite APHA show circuit. 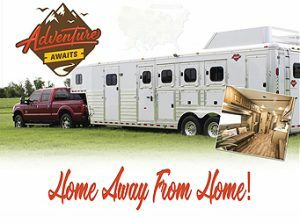 Caliendo has stayed at fairgrounds in both a living quarters horse trailer and a motorhome and shares her perspective on making the switch.